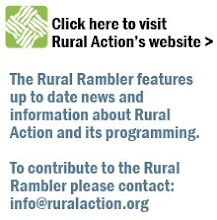 The Rural Rambler: Tomorrow - Join Rural Action for Some Holiday Spirits! Tomorrow - Join Rural Action for Some Holiday Spirits! Join the folks of Rural Action at Casa Nueva in Athens for an annual holiday tradition as we toast the end of another great year! No formal attire required. Friends, family, even strangers are welcome to share our table and hoist a glass to our Ohio home. The revelry will begin around 4:30pm this Thursday at the Casa Cantina (map). Feel free to just drop in or, if you'd like more details, call Candi Withem at the Rural Action office - 740-767-4938.